I admit it, trying to eat my way through Reading Terminal Market is a chore sometimes, though one I’ve taken on willingly. I like food and all, but not everything’s to my palate. Other times, there’s trepidation. What if the food is just bad? That’s how I felt approaching my date with Pearl’s Oyster Bar. 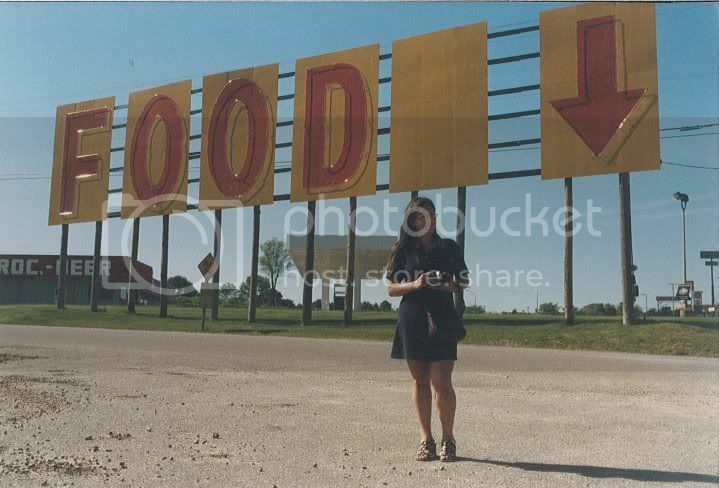 The Yelp reviews are not good. And since oysters on the half shell are among my favorite foods, my trepidation was bordering on a preemptive nixing. all photos were taken by Whit Strub, photographer (and eater) extraordinaire. 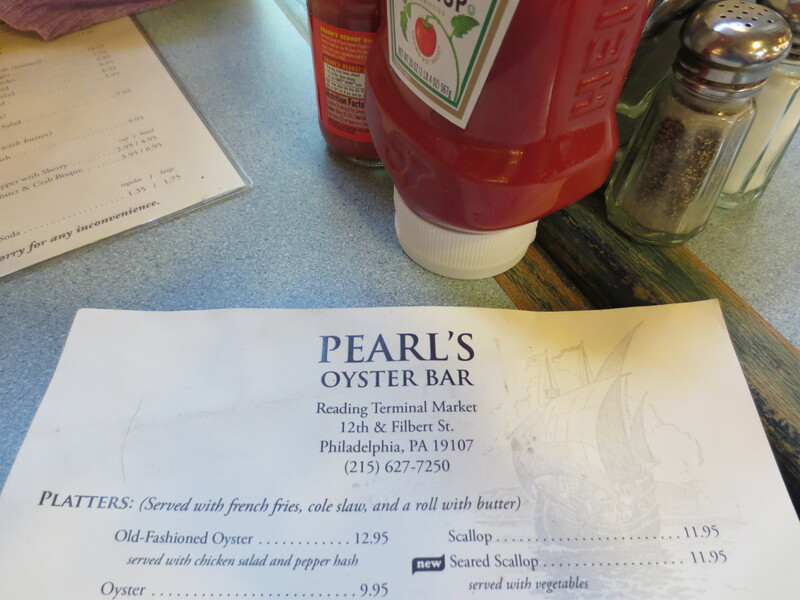 Well, you can put away your cease and desist order, Pearl’s Oyster Bar lawyer. I was more than pleasantly surprised with my meal, which acted like a portal back in time to an earlier culinary era. One when the phrase “American cuisine” might have had some meaning because there were a cadre of people working hard to claim it. I’m referring to the Progressive Era at the turn of the 20th century, when it became a national project to rationalize that which had formerly been idiosyncratic. Most of us are pretty aware of what happened in government, thanks to our history teachers, but may know less about the birth of “domestic science” (which became “home economics” and has now morphed again into the very disturbingly named “family and consumer sciences”) and which was led by women who wanted to make sure that the food created in American kitchens was as clean and pure as the meat being butchered in Chicago slaughterhouses (joke). Course, part of the goal for domestic scientists was to take the new immigrants who brought pungent foods like parmesan cheese, pumpernickel bread, sauerkraut, and pickles with them and turn them into Americans. Part of that process meant teaching immigrant women to sap out those tasty flavors in order to create food that was deemed nutritious but not overly exciting to the system. As you can imagine, this wasn’t particularly popular with the immigrant women, but it did spawn a whole new definition for American cooking. What does this have to do with Pearl’s Oyster Bar? Everything! 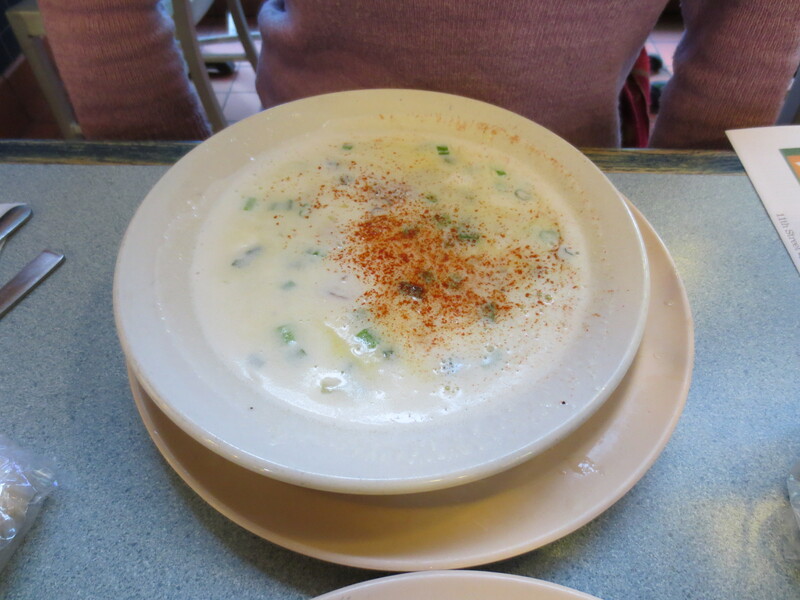 See this oyster stew? I’m sure that this recipe could date back to at least the early 20th century, if not the early 18th. Milky and mild, the dusting of paprika on top was wholly for aesthetics. The dish reminded me of a passage in Laura Shapiro’s wonderful book Perfection Salad: Women and Cooking at the Turn of the Century, in which she describes domestic science’s founders’ “fondness for whitening their food before eating it.” But floating throughout were meaty oysters chased by flecks of green onion, giving it some chew and substance. 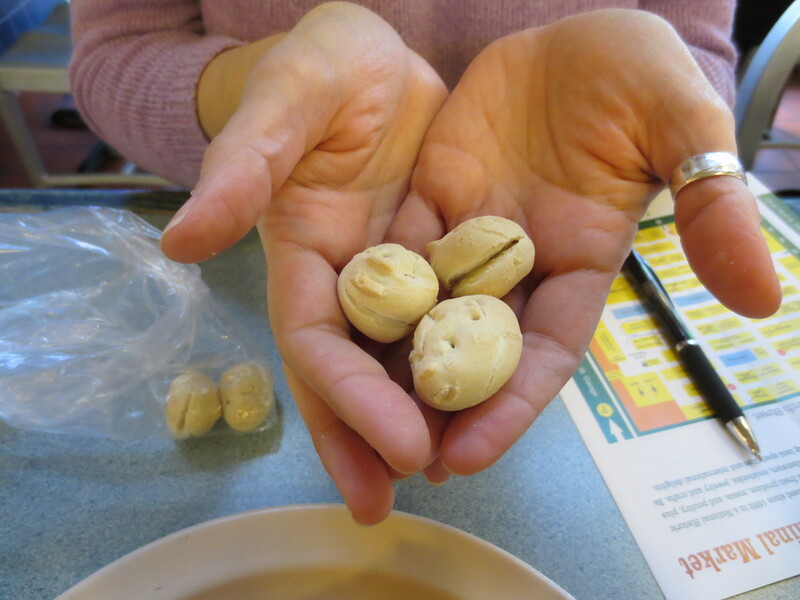 Better yet were the oyster crackers that accompanied it, those hard nubbins of plain dough that were invented for oyster stew and which were manufactured first in Trenton, NJ, at the Original Trenton Cracker company. This was food for childhood, both my own and our nation’s. Stew wasn’t enough for a real review and there were no oysters on the half shell available that day, so my companion and I opted for an oyster po’ boy sandwich. 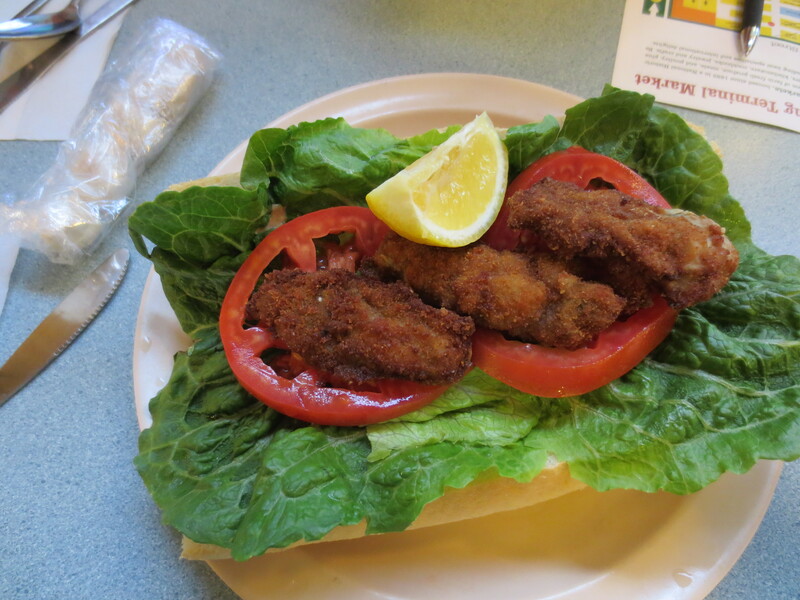 Really, no po’ boy in the Reading Terminal Market is going to beat Beck’s Cajun Cafe’s offerings, but this one had its merits, especially the crispy oysters, though there weren’t many. I slathered my half in tabasco, which added brightness and zing. All in all, we left Pearl’s sated and happy, having spent a lovely time in its dining area (and having its own seating is one of Pearl’s advantages). A place like Pearl’s reminds us of our food heritage, as much as a soul food or a Polish restaurant does, even if that heritage was created more for the purposes of scientific triumph than pure taste. 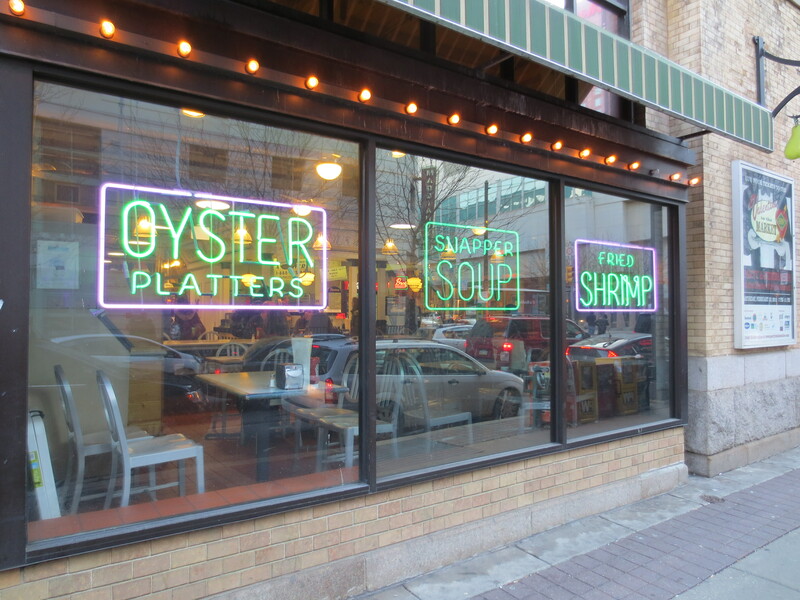 This entry was posted in Uncategorized and tagged oyster stew, oysters, Philadelphia, Reading Terminal Market, seafood. Bookmark the permalink.